A FREE, SAMPLE, COMPUTER-AIDED DTV RECEPTION STUDY, DEVELOPED FOR YOUR HOME ADDRESS. Biro Engineering provides a more comprehensive and better organized Digital TV Reception study than anybody. Period. Simply E-Mail your street address to us and we will respond with the reception information, as shown in the sample Computer Run and Signal Direction Sheet below. Have a rotor-mounted rooftop antenna? 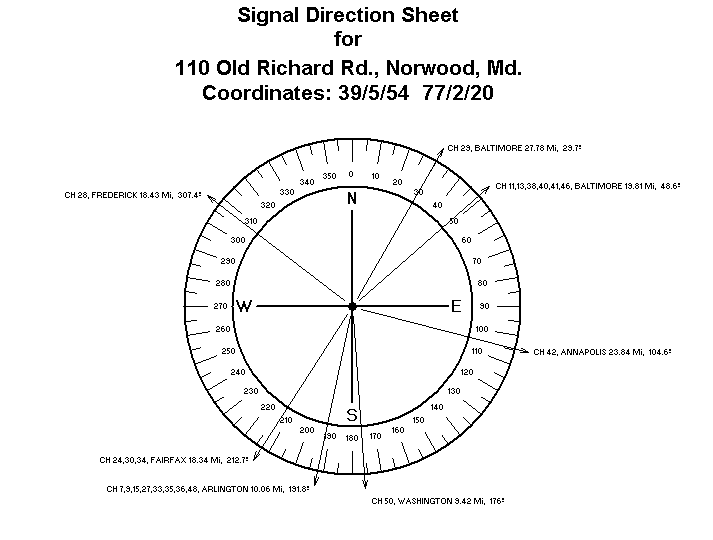 The signal direction sheet is your assurance that the search antenna is correctly oriented. Everybody needs complete, up-to-date DTV reception information for their rooftop antenna. Although Cable TV is the primary source of television programming, many people still have a rooftop antenna from the old, analog days, and are interested in what DTV stations can be received with that old unit. Over-the-air viewers can now watch new, ”MULTICAST” DTV programs, not carried on cable. If your in-laws have a lakeside bungalow, not served by cable, complaining about poor TV reception, wouldn’t be great to please them with high quality over-the-air HDTV pictures? Invited to baby sit for the sister-in-low, where satellite reception is less than perfect, or not carrying all local stations? Could over-the-air DTV reception make her very happy? Cable and satellite providers offer a tremendous number of channels, but the system employs data compression, encoding and other special techniques that compromise picture quality, resulting in blocky, pixelated images. Over-the-air DTV reception is the best way to enjoy Broadcast delivered HDTV programming at full resolution, studio quality. Due to contract disagreements between broadcasters and cable companies some of the major networks may not be available on cable in your area. Over-the-air reception may fill-in that gap. Low Power TV stations, delivering local area oriented educational or religious programs, are usually not carried by cable systems. A rooftop antenna gives access to these local stations. A one-time rooftop antenna investment can provide years of free HDTV reception. You can watch amazing high definition broadcasts and get better quality than expensive satellite subscriptions. The HDTV Antenna is a Myth - an expensive, needless myth. Are you fooled by the large ads promoting HDTV antennas, and antennas “optimized” for HDTV reception? Do you know what an HDTV antenna is? If you do know, forget it immediately. There is no such thing as an HDTV antenna! The antenna is a piece of metal (aluminum) structure, designated to resonate on a specific frequency or on a range of frequencies.What makes something High Definition is the content, the way how the RF carrier is modulated. The antenna has no clue what is the resolution of the TV picture, whether the signal is analog or digital or FM modulated, or not modulated at all. The antenna does not care that you intend to receive HDTV, as it does not care whether you watch the evening news on CNN or on an ABC network station. All TV antennas with similar technical parameters, such as high antenna-gain, narrow main beam, reduced side-lobes and low VSWR, receive equally well analog and digital stations. In case you still have a rooftop antenna, installed many years ago for the reception of those good old analog stations, it may flawlessly to receive the new Digital TV stations. Those DTV stations may have moved, but using your complimentary Signal Direction Sheet to re-orient that antenna, you could be enjoying a large number of channel for free!